Years ago I taught in a middle school in Brooklyn. One afternoon a week the kids would read silently – well, that was the idea – from a classroom library kept in a wheeled locker. One day a girl held up the book she was reading and said she’d emailed the author, who replied that he’d come visit. Since kids are, in my experience, second only to adults for saying obviously unbelievable stuff, I nodded and carried on. A couple weeks later we were all in the auditorium with the author up on stage. I must tell you, Gentle Reader, that this school was not overly distinguished by civility. I figured he’d get his head handed to him. But he talked about his book Be More Chill, and the kids loved it. I was impressed. 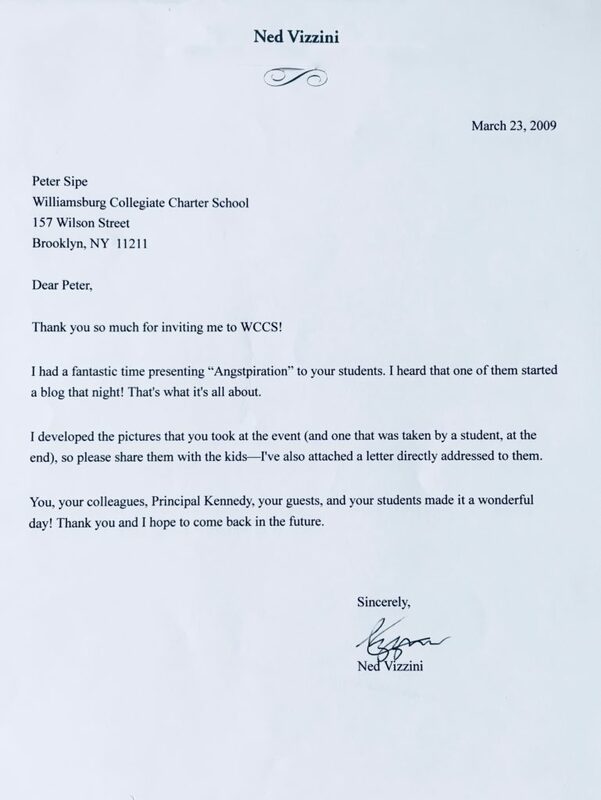 A few years later – almost ten years ago to the day – I emailed Ned Vizzini myself. I was then still teaching in Brooklyn, but now at a less chaotic middle school. I invited him to come talk to our students. He readily agreed. When I told him I didn’t know how much we could pay him, he said just to pay whatever we could. Just to recap: he was paid (significantly) under the going rate, gave a talk to all the students and afterward ran a workshop, then developed and sent me pictures, and a thank-you note, and a letter to the students. In the years that followed I’d send him stuff I’d had published. He was always very kind and encouraging. In our last exchange we shared the joke about how writing editorials is like wetting your pants in a blue serge suit (you get a nice warm feeling, and no one notices). He took his life a few months later. Here’s his New York Times obituary. That teenagers find Be More Chill relatable is what convinced Gerald Goehring to produce it. That, and some astonishing stats — Goehring says the cast album has received “well over” 160 million streams. In fact, Goehring says the off-Broadway run sold out without a penny of traditional advertising — just a social media presence. On the strength of its fans, Be More Chill has moved to Broadway. Author PetePosted on March 2, 2019 March 2, 2019 Tags Ned Vizzini, R.I.P. Because Foch rejected German requests for a ceasefire while the Armistice was being negotiated … sixty-seven hundred and fifty lives were lost and nearly fifteen thousand men were wounded. Worse yet, British, French, and American commanders made certain that the bloodshed continued at full pitch for six hours after the Armistice had been signed. The delegates in Foch’s railway carriage put their signatures to the document just after 5 A.M. on November 11th … Nonetheless, Allied soldiers scheduled to attack that morning did so until the very last minute. Perhaps the above unfortunates at least found time that morning to contemplate how neat triple elevens looked. For solemn consideration of two veterans of later wars, please read the latest post on my obit site. It’s about enemy soldiers who met unusually and died in circumstances both probably would not have imagined. Author PetePosted on November 11, 2018 November 22, 2018 Tags Incomprehension, R.I.P. Sparr’s Drugs, 1960s. Northeastern University Digital Repository Service. My high school probably had a decent English curriculum, but I don’t recall, because I didn’t read most of the books assigned. I’d buy the Cliff’s Notes at Sparr’s and then read Stephen King novels instead. One day I decided there might be more to literature, so I picked up Tom Wolfe’s The Bonfire of the Vanities. He taught me good fiction need not plod. I get my love of the well italicized word from him. (I don’t try my hand at exclamation points, though. You put on a top hat, you best be Slash.) He made me look up “tabescent” and lots else. I ripped off one of his titles for my second short story. The very first post on this blog was about him. The whirl, the whirl, the whirl. RIP, sir. Author PetePosted on May 17, 2018 October 22, 2018 Tags R.I.P. A few years back I lived across the street from a Ghanaian man. One day I expressed to him my condolences on the death of Ghana’s president, whose obituary I’d just read. Kind of weird, yes, but it seemed the neighborly thing to do. In that neighborly spirit, I offer condolences to all of us on the passing of Pfc. Emmanuel Mensah. Some of my ancestors are from Norway, and I spend my weekdays with many students from other countries our president recently discussed. I will concede that what’s most important in all of this is not my feelings, but I also wish to record it was crummy to feel the urgent need to assure my kids that America values them. During college I went to see Senator Paul Tsongas, then running for president, give a speech. He told a story about his Peace Corps days in Ethiopia, and seeing on the wall of a villager’s home a photo of JFK. He asked if we should expect the same with our current president. There was much wry laughter, including mine. His question bears repeating, but not amusement. Author PetePosted on January 14, 2018 October 23, 2018 Tags Indignation, R.I.P. The other week my friend Ben sent me the obituary of Y.A. Tittle, remarking he was surprised to learn the man was not long dead. This naturally made me think of Algeria’s first president, Ben Bella. Everything is possible, since nothing is known. The most common version is the official one: that Ben Bella is in Algeria and being well treated. It might even be true. That’s from “Algeria Hides Its Face,” by Ryszard Kapuściński. Seeing as he’d written it in the mid-1960s, I decided to find out what finally happened to Ben Bella. I must add that my hopes were not high; mortality in 20th century Algeria was not overly characterized by natural causes. So I was pleased to learn that the official version was more or less true. 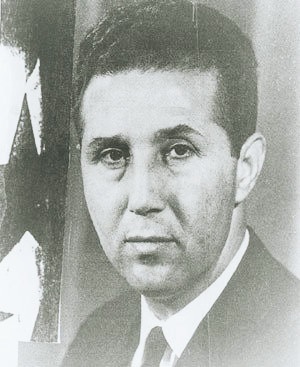 Ben Bella died in 2012. Author PetePosted on October 29, 2017 October 23, 2018 Tags R.I.P. If we do not speak ill of the dead, who will? Of all the horrors of late, not least is Tom Petty songs everywhere. It had been bad enough to hear them only occasionally. Into the bargain words like “genius” are being used to describe him. Gentle Reader, we need some unpleasant fact-face interface: Tom Petty’s music is not good. E.g. “Learning to Fly” is gemlike insipidity. “I Won’t Back Down” is an artless slog. “Running Down a Dream” seems the work of the Anti-Euphony League. It mystifies me how he hung out with Bob Dylan and Randy Newman yet remained, at least compositionally speaking, unimproved. Do I have nothing nice to say about him? Oh, alright. He declined to sue the Red Hot Chili Peppers, which does indicate a generosity of spirit, one that I would certainly lack where the Red Hot Chili Peppers are concerned. Author PetePosted on October 6, 2017 October 23, 2018 Tags R.I.P. Your forbearance please, Gentle Reader: you come here for irreverent irrelevance, but this week it’s hard astern. Meet them all at Passed Made Present. More to come this year, both there and here (which will return to normal programming, promise). Author PetePosted on January 4, 2017 October 23, 2018 Tags R.I.P. “For me it was easy: Produce text that was so good, an editor could not reject it,” he said. Every couple years I search the internet to see if there’s any news from A Girl Called Eddy or Thom Jones. Tuesday’s obituary unhappily halves this task. I owe much to Thom Jones. Although today regarded as astonishingly erudite, there was a youthful spell where I read no fiction. Then one day I was instructed – by a good woman who did what she could for my improvement – to read his short stories. Now not a week passes without me reading made-up stuff. The line for book signing afterward was long, and the slowest I’ve ever seen. 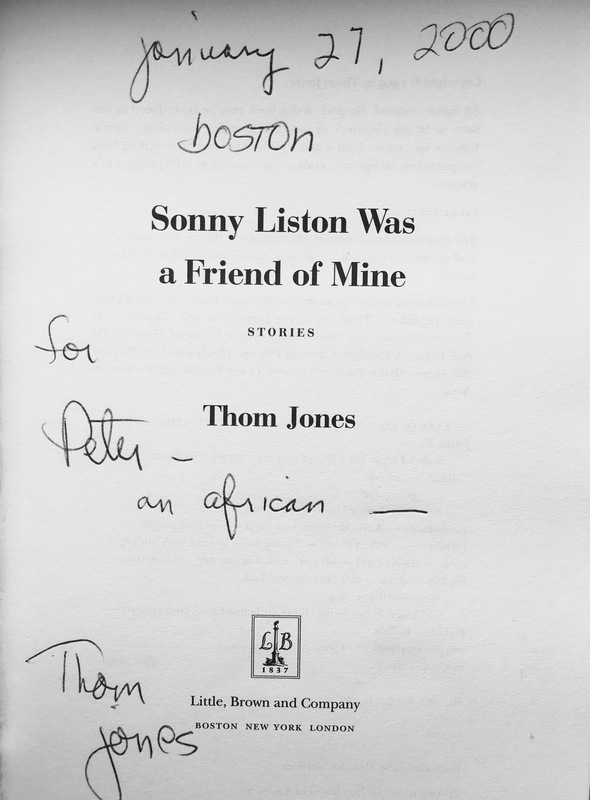 Thom Jones was talking to – as in having a conversation with – everyone. When my turn came, I was struck by how genial he was, and how interested he seemed. I don’t remember what we said, except that we talked about Africa, where we’d both spent time. 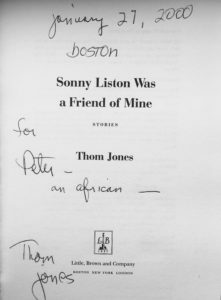 I met Thom Jones as a reader. Later, when I decided to try writing stories, he was my discouraging inspiration: half “You know, maybe I could do this,” and half “Yeah, but it ain’t gonna be this good.” I’m still right. Rest in peace, sir. Glad I met you. PS Erin, if you’re reading this, pretty please: we want You Get the Legs You’re Given, not your obituary. Or at least one well before the other. Author PetePosted on October 22, 2016 January 5, 2019 Tags R.I.P. Author PetePosted on April 23, 2015 October 26, 2018 Tags Johnny Marr, R.I.P.